Those of you who are enjoying the flying arrows and hooves that dominate the recent GBoH volume, Devil's Horsemen, will find their entertainment grow exponentially with these two new battles for the game. 2nd Homs, the follow-up battle for Ayn Jalut, pits the two great Eastern armies of the era against each other, in force: The Mamluks and the Mongols of the Ilkhan. A massive, swirling cavalry battle so large that one wing never knew what was happening on the other wing, a factor which led to the Mongol downfall. 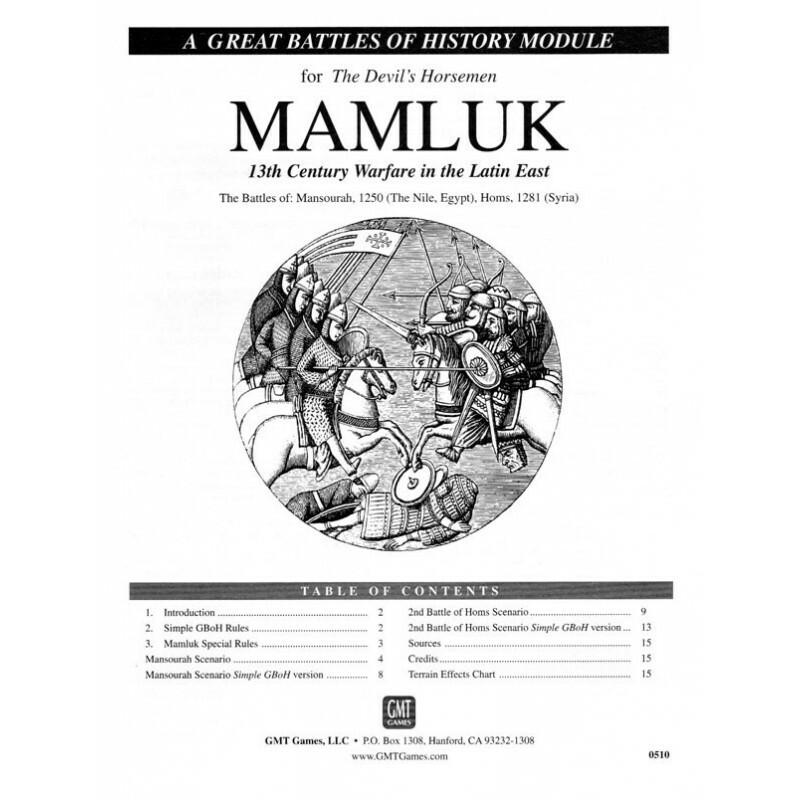 Mansourah brings in what many gamers have been waiting for: a full-blown Crusader army. This time its that of Louis IX, invading Egypt for a second time, advancing up The Nile only to get stopped by the Mamluks of the last-gasp Abbuyid Dynasty outside their brand-new city, Mansourah. Not only do we have 3 "battles" of Crusader heavy cavalry - acting as so many of their bretheren too often did throughout these wars - but lots of crossbows, field artillery, and even street fighting. 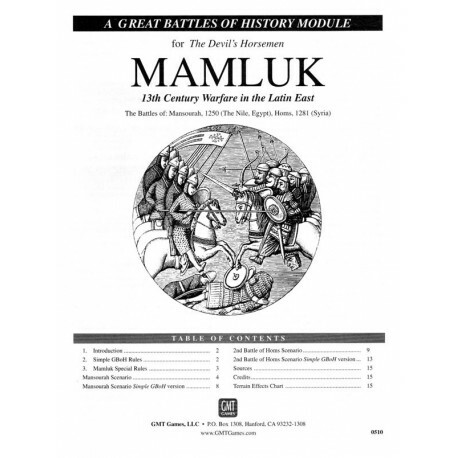 Designed by Richard Berg and Developed by Al Ray, Mamluk contains one full map, one sheet of counters, and all rules needed for these two scenarios. Everything else needed is in your Devil's Horsemen box.